An omelet is a fantastic way to start your morning off on the right foot. This slow carb variation also fits very well into a slow carb diet, and definitely doesn't leave you hungry! The recipe I list here makes enough for the two of us to split. Heat your frying pan to a medium heat. Add a bit of olive oil, and toss in the onions to brown them. Cook for 2 or 3 minutes, until they have softened. Season the bean/onion mixture with coarse salt, pepper, cumin, and oregano to taste. Advice: for the salt, a little goes a long ways. Also, cumin on beans is fantastic, and I've yet to find "too much" cumin on my meals. Mix the spices into the beans and onions. Stir periodically, cooking for around 6-8 minutes. I find this cooks the beans enough to give them a nice, soft texture, while being fast enough to be able to prepare breakfast without rushing. Add the big handful of spinach to the pan, and start slowly mixing it into the bean mixture. It is done when it is all wilted and a part of the mixture. Crack the eggs right onto the top of the bean/spinach mixture, add the egg whites, then immediately start stirring to mix it all up. 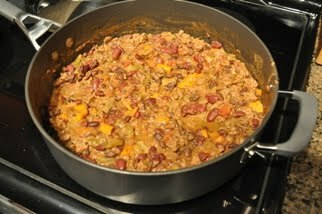 Make sure it spreads out to cover the entire pan, and also make sure that all of the bean mixture gets mixed in, so that you will have one big piece and not one big one and several small unattached parts. Let cook until the eggs have set. To help this along, sometimes I will cover the frying pan with a lid to keep the steam in and essentially cook the eggs from the top. Once set, pry the omelet up around the edges, and then slide it onto a plate. When half of it has slid out, flip the second part over top for the fold. We always eat our omelets with medium salsa (no sugar added) on the side. I also always shake on generous amounts of Frank's Red Hot sauce. Though not technically allowed on a strict slow carb diet, sometimes we will sprinkle a little big of grated cheese (we like Kraft shredded Mozza-Cheddar), or crumbled feta cheese on to the setting eggs prior to folding it. Just a little big adds a very nice flavor.